A couple of months ago, Adam asked, in his sweet, inquisitive, “I-want-to-understand-everything” way, if we had a Bible. Uh, yes, son. We do. And how many times have you announced that in Sunday School? I can see why he might be confused. Instead of reading the actual book, I read The Bible on my phone. I have the YouVersion app and I use it everywhere. Bible study, Sunday School, and even during church occasionally. I think it’s pretty amazing, to be able to carry a Bible around everywhere with me like that, but I never thought about how it would seem to my son. With that in mind, I came up with a simple Advent calendar idea for this year. 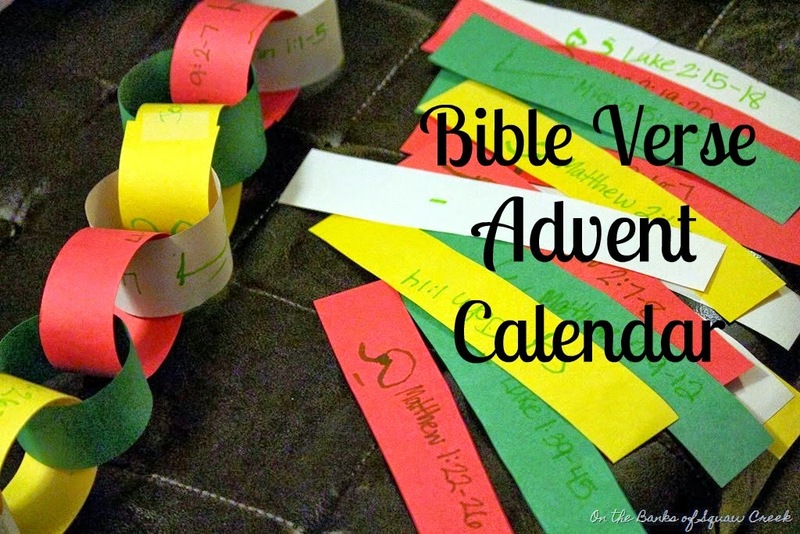 I saw a list of Bible Verses to read as a countdown to Christmas on Pinterest, and decided to make a simple paper chain with Adam. Adam numbered the strips for me. We worked on the ottoman because the dining room table looks like this. Does anyone else’s house look like Santa’s workshop exploded while in the midst of Christmas decorating? Anyway, I wrote the verses on the strips, and we taped them together in paper chain fashion. And then hung the chain across the doorway. Every night, we’ll tear off one strip (in order), look up the passage, read and discuss. Keeping Christ in Christmas. And showing my kid that we DO have a Bible, and I even know how to use it! Love it! I pinned the same list but didn't do anything with it yet. Great idea!